As you age, good posture becomes more and more important for the functioning of your body. If you haven't practiced good posture when you were younger, your back will bend forward, giving you a hunched over appearance and putting pressure on your internal organs. Your shoulders will get forward-rounded, making your head droop and restricting your rib cage so it is harder to breathe properly. Lastly your pelvis will either rotate forward or backward making walking and sitting up straight difficult, resulting in extreme back pain. Good posture not only keeps you healthier, it also makes you feel more energetic. That's because when your body is not in good posture your muscles have to work harder to keep your body erect. Good posture also helps prevent sports-related or exercise injuries. To find out if you have bad posture you can do the simple wall test. Stand with your back against a wall as you would normally stand up straight. You will have good posture when your heels, back of your calves, upper back and head comfortably touch the wall. If you strain to do this then you possibly have deviations in your posture. Another test you can do which would be more accurate is the string test. Tape a piece of string to the ceiling and let it hang down until it almost touches the floor. You can put a small weight at the end of the string to keep it straight. Stand next to the string aligning your shoulder next to the string and have someone take a photo. To have good posture the string should "slice" your body with a line running through your ear, down the middle of your shoulder, middle of your pelvis, knees, and feet. You can use the same string test to perform a frontal test and see if your body is swaying to one side or the other. Regardless of which of the above postures most closely resembles your posture, structural corrections will, quickly and efficiently, help you attain good posture, as in Posture A. Each visit, postural changes will be monitored as unwinding progresses. As your structure is corrected, the muscles will let go of compensations, because they are no longer needed, and good posture will return effortlessly, as unwinding progresses. 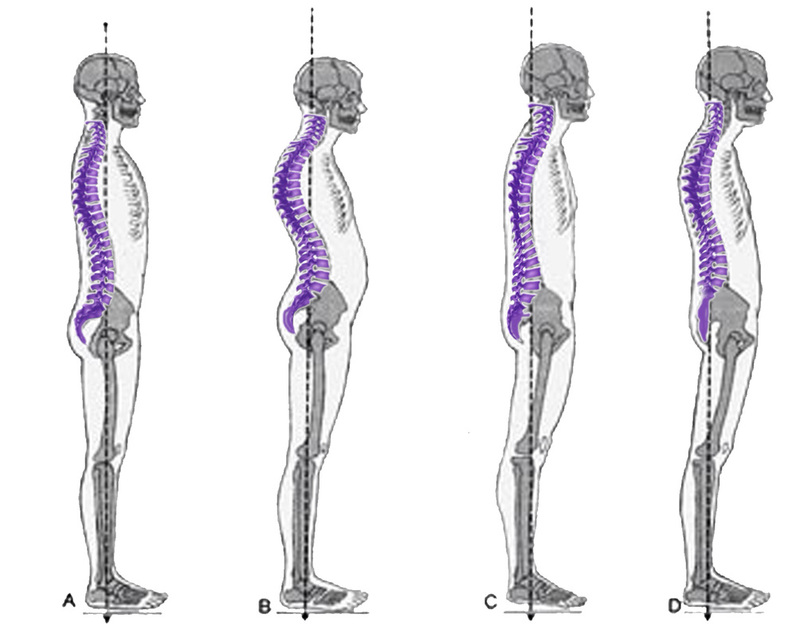 As your structure improves, your posture improves, and breathing becomes easier - and pain goes away. Reliably. Consistently. Do not wait until you are older to start correcting these problems - Start Today!